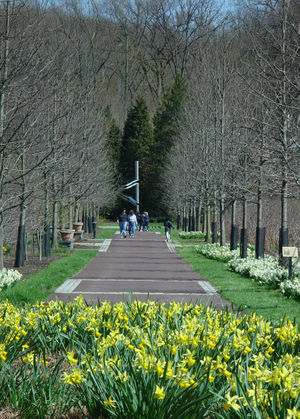 A spring scene at the Morris Arboretum of the University of Pennsylvania. Morris Arboretum of the University of Pennsylvania began in 1887 as Compton, the summer home of John and Lydia Morris, brother and sister. The I.P. Morris Company, an iron-manufacturing firm founded by their father and later run by John Morris, was a source of family wealth. The land the Morrises purchased in Chestnut Hill was barren, with poor soil that drained too quickly; but with diligent care they surrounded their home with a landscape and plant collection devoted to beauty and knowledge. Two Lines, a sculpture by George Rickey marks the former mansion site. The Widener Visitor Center was formerly the carriage house. John and Lydia Morris laid plans for a school and laboratory at Compton devoted to horticulture and botany. Through the stewardship and vision of the Quaker family, Compton became the Morris Arboretum of the University of Pennsylvania in 1932. Listed on The National Register of Historic Places, it is an interdisciplinary resource center for the University, and is recognized as the official arboretum of the Commonwealth of Pennsylvania. Science, art, and humanities are pursued through a variety of research, teaching, and outreach programs that link the Arboretum to a worldwide effort to nurture the earth's forests, fields and landscapes. Note: The above description came from the organization's History page. The Origins of Morris Arboretum & The Mansion From Which It Bloomed, Hidden City Philadelphia, June 26, 2018. This page was last edited on 4 January 2019, at 00:33.